Correct grammar (and correct is probably not the best word) is determined arbitrarily at best. Most rules of English are agreed upon implicitly and unanimously. Others are hotly debated. And then there are the plethora of language issues that are indifferently undecided. 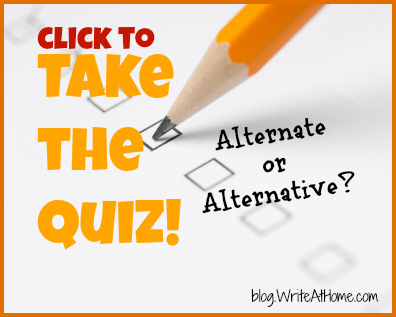 Should you say alternate route or alternative route? Should we be exploring alternate energy sources or alternative energy sources? Is a back-up catcher an alternate or an alternative? Stan alternated between taxidermy and competitive wood planing. If you are looking for a verb, alternate is the only option. The words are clearly differentiated as nouns. There is rarely any confusion here. An alternate is a person who substitutes for or alternates with someone else. Jim qualified as an alternate on the Olympic hog-calling team. An alternative is a second option. Helga offered a bowl of borscht as an alternative to Ben’s meatball and onion sandwich. Generally speaking, alternates are people and alternatives are non-human. Confusion emerges when the words are used as adjectives. 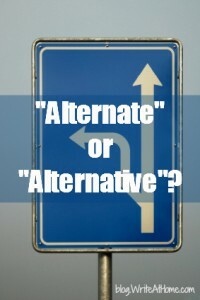 Sticklers will insist that alternate be used only to mean “every other,” while only alternative be used to mean “substitute” or “replacement.” They cringe at expressions like alternate route or alternate energy source, claiming that alternative is the proper choice. But common use, even in print, considers the two words interchangeable as adjectives referring to an option. Most dictionaries agree. It is acceptable to say either an alternate selection or an alternative selection. I like the alternate squares of red and green on his socks. Alternating is a synonym of alternate in this sense. I like the alternating squares of red and green on his socks. It has become idiomatic to use alternative to mean “different from the usual or conventional,” as in trendy terms like alternative rock, alternative medicine, and alternative lifestyles. Don’t use alternate in this sense. If all this is too much to comprehend, here’s my simple trick to differentiate the adjective forms of these words: If both alternate and alternative sound okay in a given context, it’s probably okay to use either one, but using alternative will be less likely to offend any grammar sticklers. Think you’ve got it? Take the quiz and test your knowledge! Comments? Differing opinions? Uncovered questions? Please leave them below! You’re trying to inform people about grammar and writing, yet you omit a preposition in your very first sentence. Using “alternate” instead of alternative seems to be something that Americans and Canadians do in particular. It is definitely not correct in the English of England. British people don’t use it. 90%. I didn’t even read the post first! My answers on this one aren’t authoritative. It is just a preference of mine. I only got 70%, but two of the ones I got wrong were because either of the words were correct. Thanks for the quiz!